Randy Vercauteren, RIT’s director of parking &#8232;and transportation services, regularly observes the parking habits of students, faculty and &#8232;staff. Here, he looks out at the parking lot near the Chester F. Carlson Center for Imaging Science. The other side of the building provides &#8232;a vehicle-free view of the landscapes and &#8232;design of RIT’s interior. Randy Vercauteren, RIT’s director of parking and transportation services, is a self-described data nut. And we’re not talking about any kind of data. He is a connoisseur—dare we say, savant—of parking and transportation data. 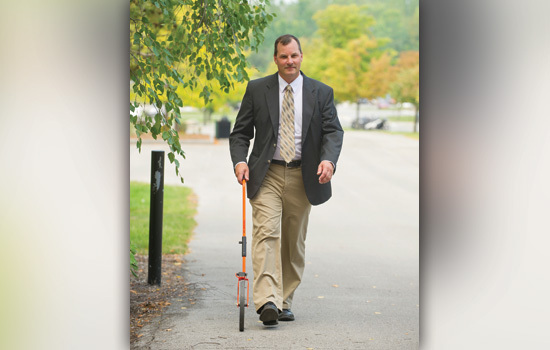 He calculates distances from parking lots to campus buildings, converting the walk time to feet, assessing that it takes the average 3-mile-per-hour walker five minutes to walk one-quarter mile. But aside from calculations and estimations, Vercauteren is more concerned with, in his words, the “feel” of the walk to the pedestrian. While the average RIT employee might find these facts useless and mundane, it’s this type of data that Vercauteren thinks about day and night. “The most common complaint I hear is that there simply isn’t enough parking on campus,” he says. “I’m very sympathetic to the conditions of the walk from parking lots to buildings. My struggle is how to connect available parking with where our customers want to park—and have our customers accept that. And of course, parking seems worse when the snow is flying or we’re caught in a rainstorm. Vercauteren explains that as RIT’s population expands, so does the academic corridor. And as a result, campus parking is naturally being pushed farther away from academic buildings. His team is charged with helping to ensure pedestrian safety, first and foremost. Some employees are happy to park a little farther away from their destination. Colette Shaw, a student support specialist, usually parks in A Lot, near Building 99, and views the daily walk as a way to burn extra calories. Vercauteren is aware of the influx of new construction—happening simultaneously— that continues to make parking management difficult. Construction for the Gene Polisseni Center is expected to begin during winter quarter, displacing approximately 300 commuters in U Lot, along with Sebastian and Lenore Rosica Hall near the National Technical Institute for the Deaf impacting M Lot, Golisano Institute for Sustainability affecting those who park in J and T lots, and Institute Hall impacting those in F Lot. Vercauteren’s open-door approach to parking and transportation makes it easy to find answers to certain “burning” questions, such as whether RIT will eventually run out of parking, construct a parking garage or charge a fee to park on campus. M Lot, near Rosica Hall, is expected to re-open by fall 2013. According to Vercauteren, the current policies and procedures in place will prevent RIT from being in immediate jeopardy of running out of parking. But he notes that his staff is constantly assessing variables including student enrollment, faculty and staff employment figures and the current resident and designated resident parking restrictions, which all play significant roles in the parking strategy. Vercauteren says he thinks the “pay to park” idea needs to be examined and can offset the cost of maintaining parking facilities and providing alternative transportation, like buses and shuttles, to and from campus. So what’s it like to work in what is arguably the most misunderstood department on campus? For Casandra Allen, customer services manager, parking is personal. She says it’s an adventure as she meets with students, faculty and staff regarding their parking concerns. Look for alternative parking instead of parking in the lot that’s closest to your building. Just because you can’t see the lot from your building doesn’t mean there isn’t one nearby. It may be hidden on the other side of a building or located closer than you think. Experiment on a nice day and time yourself to see how long the walk takes. Don’t assume that a farther parking lot is miles away. In many cases, it may take as little as 2 to 3 minutes more to walk from your car to your destination from an alternate lot. Cut through buildings to reduce the time walking outside in inclement weather if you choose to park in a lot that isn’t adjacent to your destination. Call the parking and transportation office or visit the office in Grace Watson Hall. Staff is on hand to provide information on alternative lots not far from your destination. Make a commitment to a healthy lifestyle and choose to park in a lot farther away from your destination. This ensures that you will make strides toward healthier living at least twice a day. Purchase a reserved parking pass, which is one way to ensure that you get a spot in the lot you want. However, reserved passes are limited. Go to www.rit.edu/parking for information on low-emission and fuel-efficient vehicles, and for other campus parking details. RIT parking and transportation services issued 17,152 citations during the 2011–2012 academic year. There are 5,961 parking spaces associated with the academic buildings on campus. There are 4,664 parking spaces associated with RIT residences. There were approximately 17,000 registered vehicles on campus during the 2011–2012 academic year. The RIT Active Transportation Improvements Project received a 2011 Design Award from the New York Upstate Chapter of the American Society of Landscape Architects for its efforts in re-balancing transportation modes, including walking, bicycling and other modes of human-powered mobility, on campus. A knack for parking runs in the family. Randy Vercauteren’s parents invite spectators to use their property for parking during Green Bay Packers home games due to the proximity of their home to Lambeau Field, which is right across the street.